If I’m honest, I reached a plateau in my skiing some years ago; I kind of accepted that I’d reached the limits of my body. I wasn’t too unhappy with this as I felt that my skiing was quite good, at least for my age. But wouldn’t it be nice to get just a little bit better? Which is why I was attracted to Carv Digital Ski Instructor. I’ve been skiing for almost 40 years – and, no, unlike my 14-year old son, I didn’t start at the age of 3! Perhaps I should have, as he’s now far better than me. I look at my son’s skiing with unashamed jealousy and wonder why I can’t be as good as him. Well, I’m not the kind of dad who simply rolls over and lets the younger generation through! No sir, I’ll try anything to regain my dignity and rightful place in the family hierarchy! I think I’m right in saying that our sets were from the first full-scale production run for the product. I say ‘we’ because my son was so impressed by the concept that he also had to have a set – bah, there goes my secret weapon. At £250 a set, it wasn’t exactly an easy decision to commit to, especially as there were no independent reviews out there. But the concept was just so enticing (as was the desire to improve my skiing). 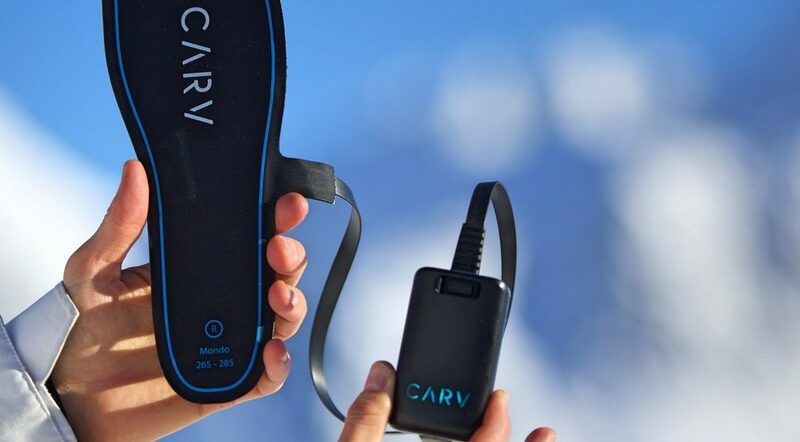 Carv is exactly what it says: it’s a digital ski instructor. It monitors your skiing performance turn-by-turn and talks to you as you’re skiing (of course, you can switch this off). Unlike a human instructor, who will tell you afterwards that you’ve done it all wrong, Carv tells you in real-time, so you can, on the next turn, change what you’re doing and get it right. Carv works with you on separate parts of your skiing: balance, angle, pressure, etc, but it doesn’t overload you with advice and information. 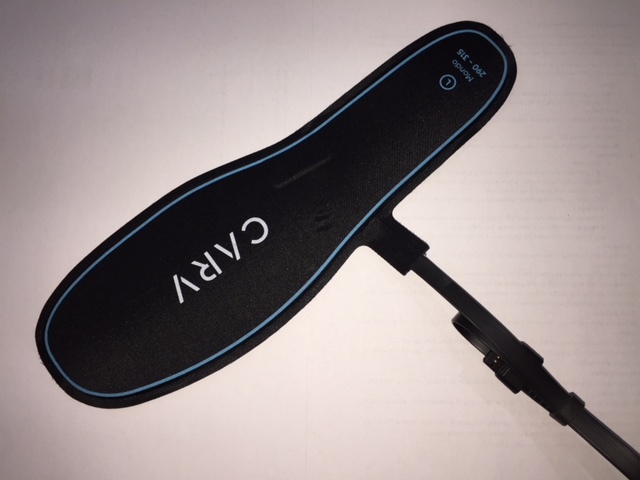 Carv comes in 3 parts: the insole (the core of the product), the tracker (essentially a battery and a communication device to connect to your smart phone), and an App. Let’s take a look first at the insole. This is the clever part of Carv. The insole is packed full of sensors that monitor various parameters of your skiing: edge angle, balance, pressure, G-force, and others. 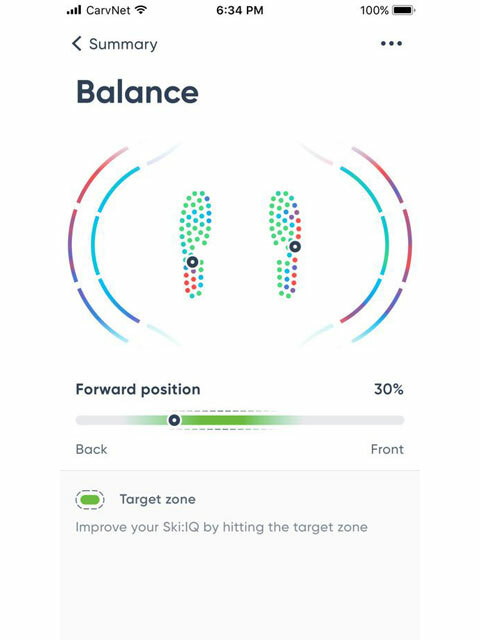 The insole is packed full of sensors that monitor various parameters of your skiing: edge angle, balance, pressure, G-force, and others. 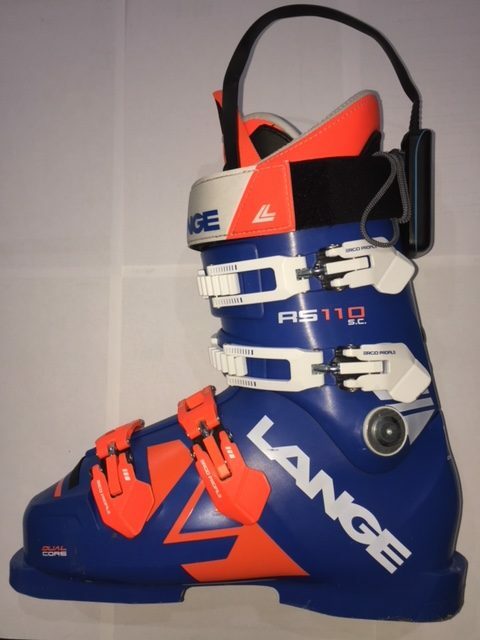 Because it’s sized to your ski boot, if you had a crazy idea of sharing it with someone else they’d have to have a similar Mondo size boot. The insole doesn’t appear to have been designed to be moved regularly from one person’s boot to another –the setup video mentions to take care not to bend the insole excessively when fitting it, suggesting that it might not like being moved between boots frequently. The insole fits between the boot shell and the liner. 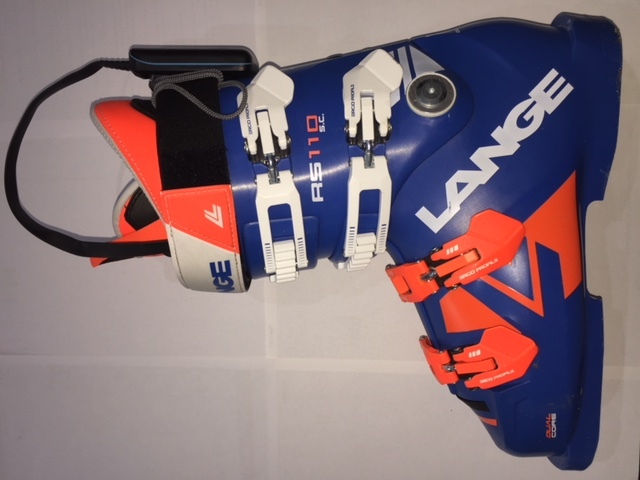 Before I took delivery, I was a bit worried about this as my son’s ski boots are fitted for racing and are therefore very tight. I was concerned about the insole raising the foot up and therefore squeezing the top of the foot against the boot. Well, that wasn’t an issue; the insole is amazingly thin, so thin that you don’t know it’s there. If you have moulded insoles (as I do) then don’t worry, they won’t conflict. Well, that wasn’t an issue; the insole is amazingly thin, so thin that you don’t know it’s there. 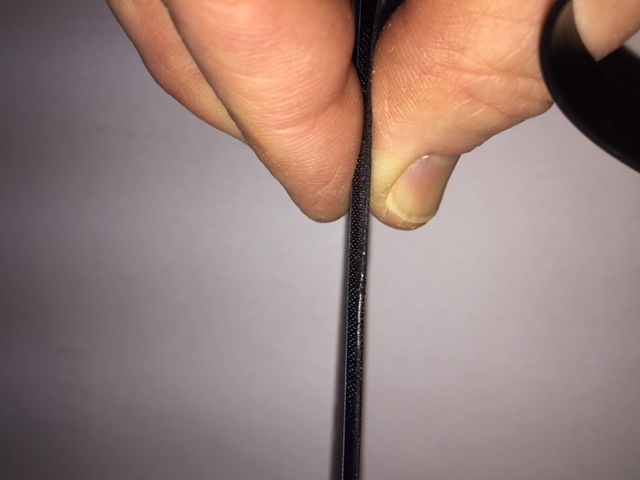 The insole connects to the tracker (one for each boot) via a hard-wired cable to the insole. The cable needs to be disconnected from the tracker to allow it to be recharged. We recharged the batteries every evening so didn’t really road test its endurance. Suffice it to say that it wasn’t a quick charging process, so to avoid losing power when skiing I’d recommend recharging them daily. The insole connects to the tracker (one for each boot) via a hard-wired cable to the insole. The brains of Carv is the App. We were using iPhones, but there is an Android version. The App provides you with lots of functionality, from drills, to challenges, to monitors, to free sessions. I started with the drills, but quickly (in my dreams) progressed to the free sessions. I found the drills and challenges a mix of annoying and inspiration. The annoying bit for me was the Super Mario type sounds that resulted from achieving the goals, and not achieving these. But, this pales into insignificance when compared to the improvements to be had in skiing ability. It genuinely does up your game to another level – and beyond. I was able to work on those things that had held me back for years – remember my plateau comment? – and seriously improve my skiing. In fact, I’d honestly say Carv exceeded my expectations. The annoying bit for me was the Super Mario type sounds that resulted from achieving the goals, and not achieving these. But, this pales into insignificance when compared to the improvements to be had in skiing ability. Carv analyses your skiing and awards you a skiing IQ from each of your runs. This IQ is averaged and can be uploaded onto a leaderboard so you can see how good, or bad, you really are. It was very pleasing to see my IQ progress steadily as I worked through the drills and challenges. It was less pleasing to see my son improve faster and move into the top 25, leaving me down in the 80s! I can see the Carv team continuing to develop the functionality as they learn more about the product. I just hope they don’t get it to the stage where it tells you that maybe you’d be better off trying some other sport – I’ll leave that to my son! So, who is Carv suitable for. Well, I’d rule out beginners, novices and those improving to intermediate. You need to have become ‘one with your skis’ for Carv to be a benefit; besides, when you’re learning it’s so much fun in a class sharing each other’s experiences – Carv would simply get in the way, and it doesn’t laugh when you fall over. So, I’d suggest Carv is suitable for intermediate/advanced, and even expert. My son is using them to improve his racing skills to great effect. Overall, Carv is for the dedicated and capable skier and it really is as good as their website claims.